Cannabis marks in jeopardy – is your industry next? Nearly 600 applications for ‘cannabis’ marks languish before the US Patent and Trademark Office, yet its patent arm happily grants protection for inventions which use the drug. Where does this disconnect come from and could other industries be vulnerable? IANA: Transition of the IANA function – what does it mean going forward? A significant change in the governance of the Internet took place in October 2016, when the US government ceded control over a core piece of internet infrastructure to ICANN. But what does this mean in practical terms? Plain packaging: Time for a change in brand protection lobbying? 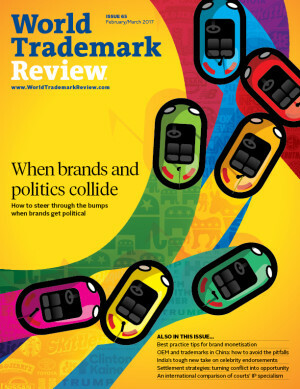 China: Is a good anti-counterfeiting strategy possible in China?